We have been having what many locals describe as a ‘cold’ winter. 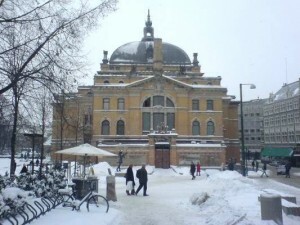 The lowest temperature recorded in Oslo came on 21 January at –12.5C (+9.5F). That’s not really cold by my Chicago standards, which see –10F (–23C) in many winters, and –20F (–29C) in some. Right now, outside my office on the Blindern campus of the University of Oslo the temperature is up to +3C (+37F) — really balmy. Snowfall is another matter. Here in Norway, generally north of the Prevailing Westeries, snowfalls tend to be gentle, though copious. Contrast that with Chicago, which sees its share of Alberta Clippers, coming out of western Canada, streaking across the border with the United States, and causing massive drifting — and blowing away the occasional garage. Winter sports are really big here in Norway. The national radio station NRK, with two channels, broadcasts all-day sports on Saturdays and Sundays during the season. These activities include cross-country skiing, biathlon (composed of cross-country and rifle shooting segments,) ski jumping, Nordic combined (with both ski jumping and cross country,) Alpine skiing, large-track (400m) skate racing, snowboarding (in various formats,) and Telemark skiing (over circuitous mountain courses with special style requirements.) All of these sports are organized into international leagues, described as the World Cup. Norway excels in all, frequently claiming the top championship spot in both the men’s and women’s versions. Successful athletes are celebrities, and earn enormous sums of money through sponsorships, appearance fees, and the like. Friends back Stateside frequently ask me if it isn’t dark and dreary here in Norway during the winter. Well, no. It is relatively dark, with maybe only four hours of sunshine in the south of the country, and none in the north, but the sun rises and sets slowly, providing for long twilight and dusk periods, with quite pretty skies, actually. Even up north there is some glow in the sky, and the Northern Lights, when the come — frequently — are indeed spectacular. Couple all this with the friendly people, almost all of whom speak excellent Engligh, with the energetic economy, and with the vibrant night life, then you have one happy and exciting place in the winter. You should come visit, and discover for yourself.